Tim Burton and Johnny Depp had made seven films together prior to the release of this week’s Dark Shadows. When Burton’s expert lens found Depp’s fantastic acting, they produced some of the most beautifully offbeat cinema America has seen the past 20 years, including the likes of Edward Scissorhands, Sweeney Todd and Ed Wood. But even the greatest of teams are bound to falter sometimes, and these two do so spectacularly in their latest effort. The adaptation of the 1970s soap opera, like so many reboots, re-imaginings and revivals of late, should have been left for dead. 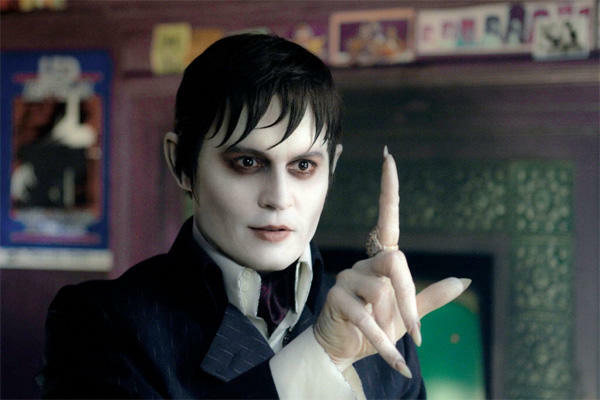 Depp is vampire Barnabas Collins, cursed to a life full of plot holes and bad jokes, or something like that. Our fanged fish out of water wakes up 200 years after being buried undead by a spiteful witch, and the zany Burton twist here is that he’s in the 1970s, just like the show! Beat-you-over-the-head evidence of that abounds, including the requisite Volkswagen Bus, the local theater marquee, and a he’s-still-alive? Alice Cooper cameo. In fact, the scenery is often telling a better story than the script, because every character of note in the film spends most of their screen time explaining to us exactly why they’re there. There’s Jackie Earle Haley, here to mumble the history of the family home to us, and how it’s his sad job to take care of it. Are you curious how times have changed since Barnabas was last above ground, even though your eyes are being assaulted with it? Don’t worry, Michelle Pfeiffer is here to tell us about the shifting meaning of horse power and to delineate the Collins family woes in the time that has elapsed. After a deluge of explication that feels a little like being chained in a casket for two centuries, we know who to root for. This family of miscreants are our heroes whether we like it or not. The problem, though, is that Burton’s spotlight shines only for Johnny Depp. Once it shifts to the other members of the household, like a misused Chloë Grace Moretz or Helena Bonham Carter, things such as character arc and meaningful dialogue become afterthoughts. The line between cute and corny begins to blur quickly, and seeing talented performers spout clichés in the name of half a dozen unfinished storylines becomes both plodding and depressing. All the quirks in Burton’s canon don’t add up to depth of character, and most of the characters here have an abundance of style and a lamentable dearth of substance. The supposed focus of this scattered story is the love/hate relationship between Barnabas and his nemesis Angelique, the witch who both adores him and wants to make his life miserable for generations. Eva Green plays the villain with relish, balancing Depp’s deadpan nicely in a couple of scenes, but most of the burgeoning chemistry between the two is thwarted by the writing. Some twisted version of deadliest catch takes place when the rivals pit their fishing companies against each other, but it’s just another disjointed piece of something that could be called episodic, if only the episodes came to some sort of resolution. Instead, all we get is a half-hearted period piece with too many commas. Each character gets a setup but no payoff, and we’re left wondering why we were introduced to them in the first place. This kind of sequel bait wouldn’t be as surprising from a lesser director, but someone like Tim Burton should be held to a higher standard. Following Johnny Depp’s acting career is beginning to feel a lot like a day at Disneyland. He’s dragged us through Pirates of the Caribbean more than enough, we’ve ridden the teacups with him through Wonderland, and now he and Tim Burton have taken us into the Haunted Mansion. Everything feels a little fake and overdone; what was once fresh and bright is now two-dimensional and well-worn. Burton and Depp’s best efforts have been films that found humanity in the strangest places¸ but unfortunately, Dark Shadows ends up being a bumpy ride amidst some parlor tricks and wooden cutouts.